In my opinion, the hand wrap drum reel is the simplest type of bowfishing reel. I find that most drum reels are very easy to set up - you need to either manually attach it to the bow with a tape or thread it into the bow’s stabilizer hole. Drum reels also don’t cost much and you can already buy a good quality model for a couple of dollars. They also tend to be made of durable materials and may last a long time even when they cost so little. The downside of this reel is that it isn’t as fast as the other two types when it comes to shooting and winding the line back when you miss a shot. This means there are fewer chances of hitting a fast-swimming fish, and second chances at missed shots may also not be that common. 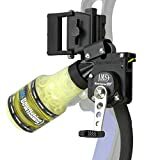 Still, if you don’t want to spend a lot on a bowfishing reel until you decide that it is a hobby you want to pursue, you may want to go for a cheap and simple hand wrap drum reel first. The second type of bowfishing reel, the spincast reel, is a big improvement from the hand wrap drum reel in that it is so much faster to shoot and reel back in, in case you miss your shot. This means there is a bigger chance that you can hit your target with your first shot or you can still catch it if you miss it once. As its name suggests, a spincast reel spins as you shoot your arrow, much like the spincast reel of traditional fishing rods work. The main difference is that the speed of a bowfishing spincast reel is so much faster than that of a traditional fishing rod is. To use a spincast reel, you need to push the bail release button before making a shot. This may become a problem because misfires may cost you an arrow when the bowline snaps after you fire. 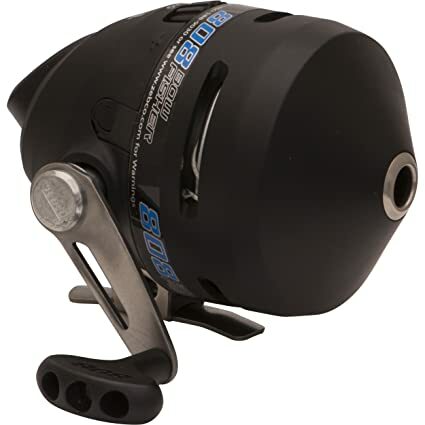 While a spincast reel may shoot the fastest arrows because the bowline tends to be lighter, this type of reel is not as durable as the other two because the speed of each shot may quickly wear it down. Because of this, you may need to replace your reel after about two seasons of using it, especially if you happen to buy a low-quality model. Retriever bowfishing reels are my personal favorite for many reasons. For one, I find it very light, which is something I prefer especially if I need to hold my bow for long hours during my bowfishing trip. Another advantage of the retriever reel is its thicker line, making it ideal if you need to hand-fight a fish that you just caught. And because you’re using a crank to retrieve the line (hence its name) rather than having the line spin rapidly back in place, you minimize the wear of the line and allow it to last longer. My only concerns with the retriever reel are that it is not as quick as a spincast reel because it has a heavier and thicker bowline and that a high-quality model tends to be a bit more expensive than the other types. Still, if you’re willing to invest on a bowfishing reel that is durable and easy to use, then you may want to consider a retriever reel for your next purchase. If you’ve tried hunting deer or other game animals, you know that it helps if you’re familiar with the habits and behavior of your targets. The same goes with bowfishing. Know where your target fish are most likely to stay at specific times of the day and set up in those areas. For example, you may want to check out grass beds because they are usually near deep water where many big fish like to hang out. Like Mark Land of Muzzy Products, I also like using a boat instead of wading in the water because it allows me to keep my accessories nearby. I can also put a cooler filled with ice in the boat and immediately store the fish I catch in it. The only time I ever wade in the water is when I need to be in shallow portions that my boat can’t reach. This usually happens during spawn season because fish tend to stay in shallow waters more. Otherwise, I stay on my boat where I can remain relatively dry and have access to my other tools and items. If you’re looking for something simple, heavy duty, and cheap, then the Fin-Finder Heavy Duty Drum Reel may be a good choice for you. True to its name, this drum reel is made of heavy-duty aluminum, making it a durable reel that can last for a very long time. 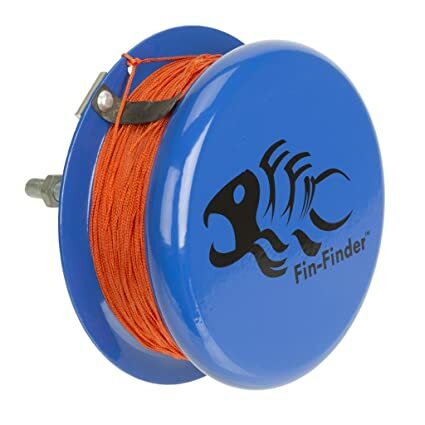 This Fin-Finder model comes with 80 feet worth of bowfishing line, allowing you to reach your targets from far away. However, I recommend replacing the line with something more heavy duty if you want it to last longer. 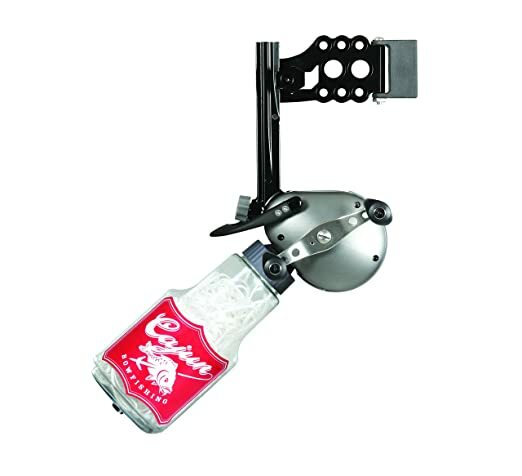 This drum reel comes with a bolt screw, making it easy to install to your bow. Just be careful when setting it up and consider filing down the edges because it may snag against the line and snap it off. I remember getting this Cajun Bowfishing kit when I was just starting out with bowfishing and I didn’t want to spend a lot on an expensive reel yet. 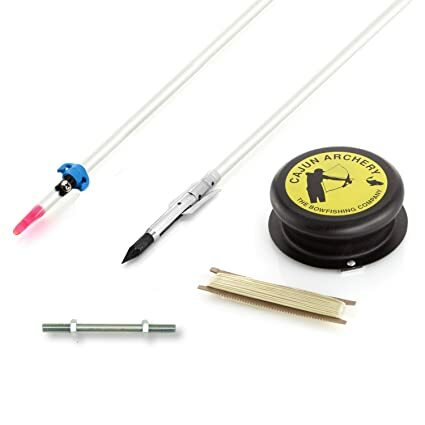 The kit came with two fiberglass arrows, a screw for installation, the actual drum reel, and 50 feet worth of fishing line. What I liked most about this starter set is that the arrows are so light so they could fly off my bow easily and hit my targets with ease. The drum reel is also relatively easy to set up and didn’t require any elaborate installation tools. However, I found that the fishing line was not that durable and it kept snapping off after a few shots. My recommendation is to just replace it with a better line and continue using the arrows since they are light and durable anyway. The AMS Tournament Retriever Pro Bowfishing Reel certainly lives up to its name. Even tournament and pro bowfishers will love using this model because it is so fast for a retriever reel, whether you’re shooting the arrow or reeling the line back in. Other than its modern design that comes with a longer handle, I also like its yellow Dacron line, which makes it easier to see when you need to wind it back to your bow. I do think the bottle where you store the line is a bit small, so there’s a chance the line will snag if you don’t store them properly before setting out. While this model is a bit more expensive than other brands, I find that it’s a good investment that both beginner and pro bowfishers may want to check out. 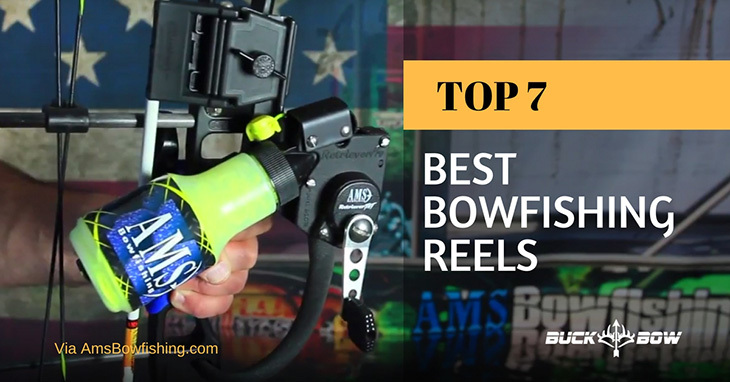 Another AMS retriever model makes it into my list of best bowfishing reels, and this time it’s the less expensive AMS 610 Retriever Pro Bow Fishing Reel. 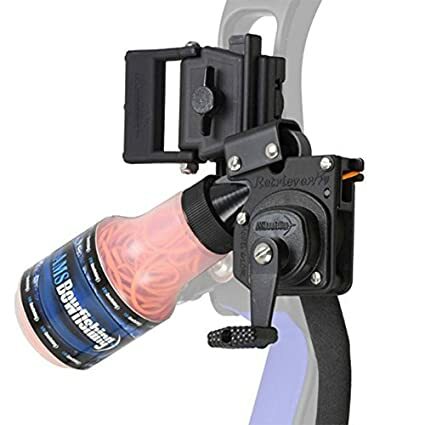 Retrieving lines has never been easier with this model - you just need to pull the trigger guard and turn the handle to start reeling in your catch (or just the line, if it’s a missed shot). The reel is made of heavy-duty brass and the trigger is made of aluminum, so you’re sure that this unit will last for a long time. 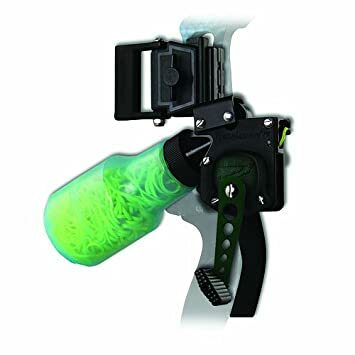 It’s also easy to use since the Hi-Vis line is stored in a clear bottle, allowing it to fly quickly as soon as you fire the shot. Just be careful when the arrow gets stuck in sticky mud or when you catch a big fish - you may need to manually pull it out of the water if it becomes too heavy. It tends to shoot loudly, too, which may scare off some game fish swimming in shallow waters. 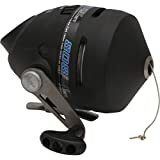 The Cajun Hybrid Bowfishing Reel AFR1300 is a cheap alternative to the AMS models if you’re looking into using a retriever bowfishing reel. It is made of strong aluminum and comes with 75 feet worth of bowfishing line, and it allows one-handed operations. I find the design of this model a bit clunky, and I dislike the white line because it’s harder to see underwater or in low-light settings. You also need to be careful when storing it back into the bottle because it tends to jam when not placed properly. Because of its many issues, this Cajun Hybrid model is not really my favorite bowfishing reel, but you may still want to check it out if you want to save some money and still get a durable reel that you can use, whether you’re left-handed or right-handed. If you’re just starting out and you want something that is fast, light, and doesn’t require lots of winding, then you may want to check out this Zebco product. I think this is a good entry level reel because it is not as heavy as other models so you won’t have a hard time carrying your bow for long periods. I also like how this model has a reversible retrieve so that any bowfisher could use it, whether he’s right handed or left handed. The classic black design also works well with any type of compound bow, bringing not only convenience but also style to you during your bowfishing trip. If there’s one improvement I’d want from this model, it’s to make the Dacron string a bit thicker so that it won’t wear and tear after a few seasons’ worth of use. Still, I find that this spincast reel is a good investment overall. 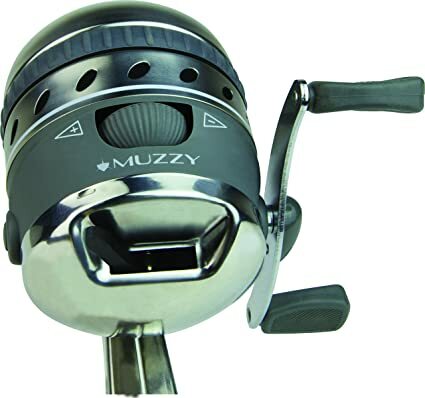 The Muzzy Bowfishing 1069 XD Pro Spin Style Reel is one of my favorites in terms of design. I like its metallic steel casing and reversible hand retrieve that both right-handed and left-handed bowfishers can use. Other than that, I also like its switch activation system which allows a free spool option. It’s like you’re using a dragless reel but you can still flip its switch, making it easier for you to hand-fight your catch and increase your chances of success. One problem I’ve encountered with this reel, however, is that it is not as easy to install as other models. For one thing, the space between the mounting brackets is a bit small so it’s hard to maneuver an Allen wrench around it. This takes it longer to set up, taking up time that you could use catching your game fish. I personally think that the AMS Tournament Retriever Pro Bowfishing Reel is a great choice if you’re looking for a durable reel that is easy to set up and use. 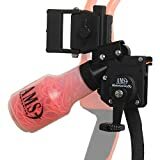 It may be a bit expensive compared to the AMS 610 Retriever Pro Bow Fishing Reel and the Cajun Hybrid Bowfishing Reel AFR1300, but I think it will be a good investment to both pro and new bowfishers. If you want something quicker, you may want to look at Zebco 808HBOW80BX3 Bow Fisher Spincast Reel, too. Aside from its classic design, I find that it’s lighter and easier to use than the Muzzy Bowfishing 1069 XD Pro Spin Style Reel. Hi, I am looking to get my girlfriend into archery. She’s about 5 foot 3 and has an amazing amount of strength. Im looking for the best bow that isn’t too heavy but not too light, and greatly adjustable. Any suggestions? I have 2 suggestions for you. I hope they will be suitable for your girlfriend.